A few months back I was given some disturbing information, there was a chocolate bar from New Zealand that I had not heard of let alone tried! I had made a simple comment about NZ's ubiquitous Moro Bar when expatriate Kiwi journalist and former next door neighbour of my sister, Lee Mylne questioned me as to how I could comment on the Moro Bar being a Kiwi icon without at the very least paying passing lip service to the Mighty Perky Nana! the innocent Moro Bar picture posted on Facebook that started this whole thing! 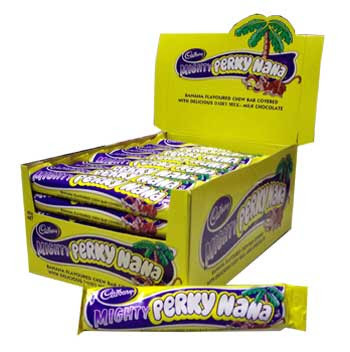 Now chocolate-marshmallow fish, chocolate-pineapple lumps (now being marketed in Oz by Pascall), the mysterious L&P soft drink and the previously mentioned Moro Bar are all common "food" discoveries for any foreigner going to NZ, but how after many many years had I missed the Mighty Perky Nana! A quick google search showed a Facebook Fan Club for this confectionery treat, but then again everything and everyone has a Facebook Fan Club so that's not really a surprise. The Cadbury website described it as "preteen confectionery" which may just hold a clue as to why I had missed this product until now. But then I was hit by a sudden dread! What if the makers of the Perky Nana were to pull a Polly Waffle on me and remove it from the shelves BEFORE I ever got to try one. In November last year when the Polly Waffle was pulled from the shelves without notice I was wracked with grief, would I ever get to taste that strange chemically flavoured marshmallow inside that strange crispy waffle like shell again? 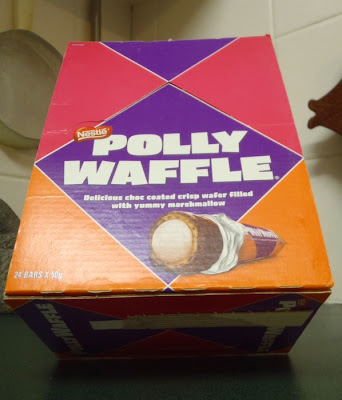 Thanks to eBay I managed to get one of the last boxes of Polly Waffles from some hoarder in NSW, but I was not going to let the Perky Nana slip me by! No sirree, this fella was going to get himself a Perky Nana! One of the worlds last boxes of the great Australian Polly Waffle, and they're all mine! Closed on Saturdays - no Perky Nana! 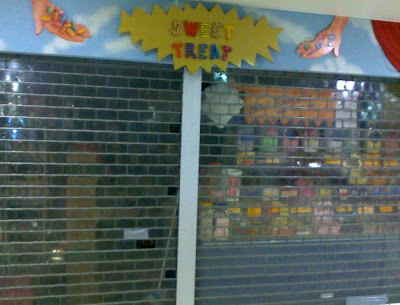 I could see to actually purchase one of these treats from across the Tasman I was going to have to make a better plan. I decided to incorporate the quest for the Perky Nana into my regular Friday night Sydney International Food Hunting Expedition. 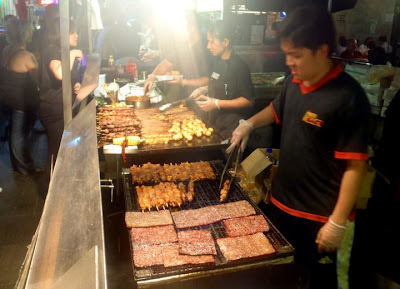 Now one of the things I love about travelling is the food of the world, and in particular street food. Being back in Australia, encamped in Sydney there is not exactly a choice of night warungs and food carts as you'd find in Indonesia or other similar Asian destinations, but on a Friday night in Sydney's Haymarket area there is a reasonable substitute for an Asian Street Food market. I wouldn't call it world class but its as I said a suitable substitute when one craves the Asian street food scene. There are a couple of sweet essentials in this area that have become part of my regular food hunting expedition in Sydney. 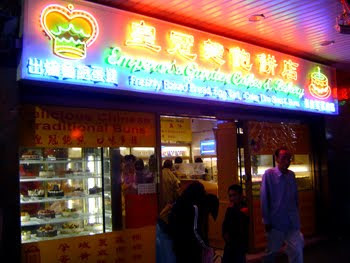 The first is the Emperor's Puffs from Emperor’s Garden Cakes & Bakery on the corner of Dickson and Hay Street. 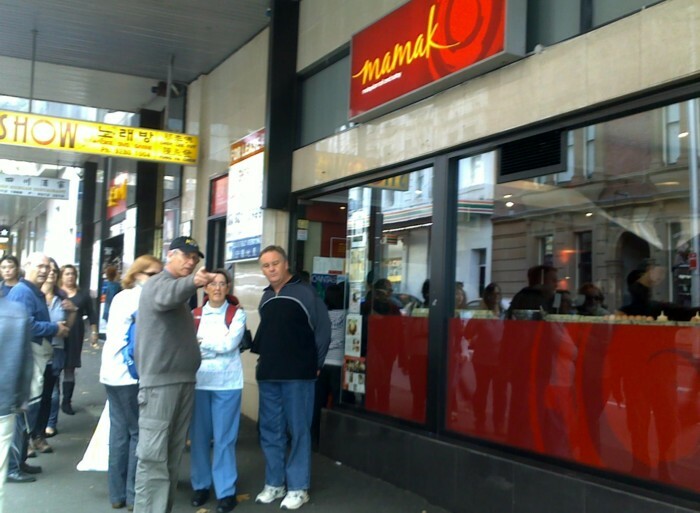 You'll often find people queued 10 or more deep into the street (particularly during the Friday night markets), at a small window opening onto the footpath beside the main shop. You have simply got to try these thing, every visit to Sydney I hit this place up for a supply of Emperor's Puff's. 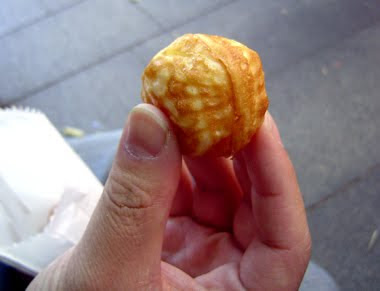 Think custard filled mini-donut ball and that's about as close as you can get by way of description without trying them. 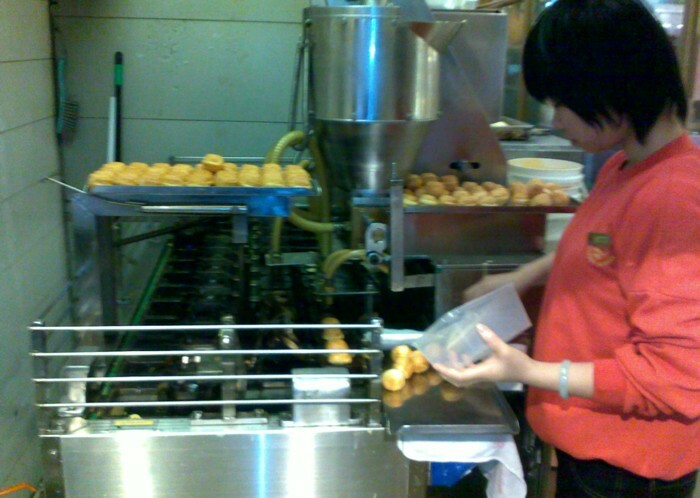 A complex stainless steal and cast iron machine clunks and rattles away in the corner of the bakery spitting out racks of hot custard filled delights as fast as people can buy them. One of the Emperor's Puffs! Delicious!! 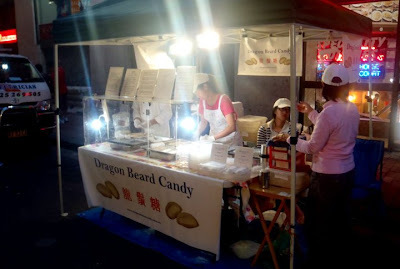 The second must buy sweet treat at Friday night's Chinatown market is Dragon's Beard Candy. This stuff is amazing and if you've never tried it you must. The Sydney maker of this incredible delight has his very own blog site here on blogger. The taste and oral sensation of this unique "candy" is hard to describe. 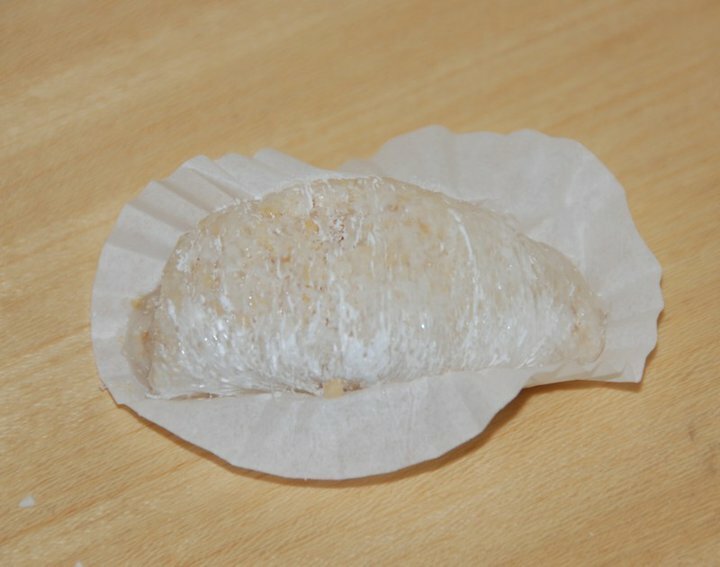 Made from "spun sugar" and containing a parcel of sweet treats including coconut & crushed peanuts it's an Asian variation on Fairy Floss one could say, and much much better. 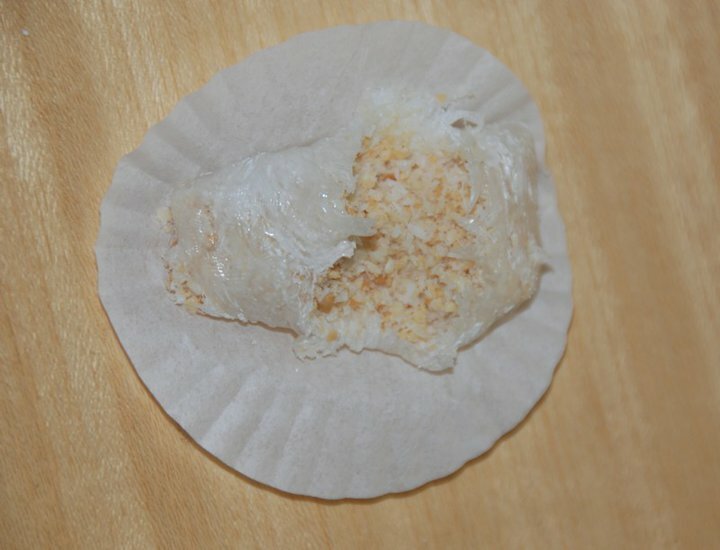 Dragon's Beard Candy - Heaven wrapped in spun sugar! opened to reveal the coconut and sugar! Now as part of this regular expedition to Chinatown I have regularly passed a Malaysian Roti place called Mamak. When I talk about the line of people most Friday nights outside the Emperor's bakery buying custard balls being 10 deep, the line up outside Mamak is mind blowing. In fact the line is so long on a Friday night I have never had the patience to wait it out and try what must be pretty good Roti Canai for Sydney siders to line up like that. So beyond what became the Friday Perky Nana Expedition, I made two seperate trips to the City - a Thursday afternoon & a Sunday afternoon and blow me down if there wasn't a huge line up on each occasion! This guy just doesn't have the patience to wait in the street to eat Roti, no matter how good it may be! Sunday afternoon crowd gathering outside Mamak waiting to get Roti! 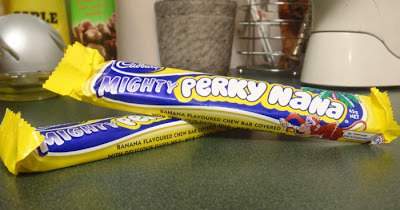 So what of the Mighty Perky Nana? Well we can all relax - I was able to purchase a Perky Nana and cross that off my list. It was chewier than expected. The flavour reminiscent of the small yellow banana lollies you can buy at the old fashioned lolly shops but wrapped in chocolate. I can't say it changed my life, experiencing this pre-teen candy bar but I can now sleep sound knowing there is one less type chocolate treat in New Zealand that I have never eaten. Now I am hungry! Great stories and looking forward to following you on your adventures. Glad I could help enrich your life! I certainly don't wait for Lunar New Year, I go hard on the ol' Dragon Beard all year round! I actually will route my flights through Hong Kong if possible to buy some authentic stuff, my favourite is sold under the brand "Hong Kong Memories" and comes from Shenzen. These ones are so light they dissolve in your mouth like cotton candy.